Do MLB Park Factors Change Throughout the Season? Just about every MLB DFS player at this point knows about park factors. Strategy is simple, right? Stack as many Coors Field batters as possible. Last season, to no one’s surprise Coors Field — home of the Colorado Rockies — led the league in runs per game (1.33) and hits per game (1.15). It finished fifth with 1.20 home runs per game. 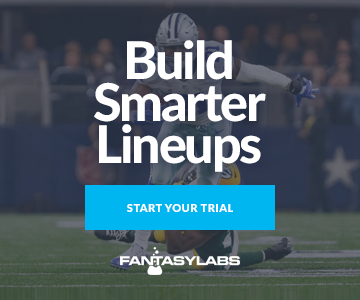 Knowing where your batters are hitting is arguably just as important in fantasy baseball as how good they are or who they’re hitting against. Coors turns even the most struggling hitters into versions of Babe Ruth. Not all parks are the same due to weather and stadium dimensions, which is one of the distinguishing factors of baseball. Can you imagine if the Houston Rockets or Golden State Warriors could expand their home basketball courts by five feet either way? Given their offensive spacing, the new court dimensions would almost certainly factor into the fantasy values of their players. These factors matter, and although their importance is known we can still tease out edges for this upcoming MLB season. One edge I’d like to explore in this piece is the seasonality of park factors. Does performance at different parks vary based on the time of the year? Some stadiums have retractable roofs, while others deal with the weather changes throughout the year. Some parks, like Coors Field and Chase Field, have positive Plus/Minus marks throughout the year. The former benefits from the elevation in Denver, which obviously doesn’t change month-to-month. Coors is a hitter’s paradise, and it pretty much always is regardless of the weather. There are some notable parks, however, that play much better in the summer than earlier in the season. Citi Field, home of the Mets, posts a -0.6 DraftKings Plus/Minus during April but a +0.6 mark during July. Globe Life Park in Arlington is an extreme example. It is the second-best hitter’s park in the month of July, evidenced by its stellar +0.7 Plus/Minus (only behind Coors), but it’s one of the worst hitter’s parks in April with a -0.5 Plus/Minus. Considering it still has the ninth-highest average ownership in April, it is clear the public is looking at season-long park factor trends instead of monthly, dynamic ones. Here are the ownership rates for each park. You can compare the two graphs above to find value. And to make research even easier, I put Plus/Minus and ownership scores on a 0-to-100 scale and found the best and worst park factor values. If a team has a high Plus/Minus and low ownership, they will have a high score. Take a look at Kauffman Stadium, home of the Royals. In April the park boasts the seventh-highest average ownership among batters at 5.8 percent. However, it’s an extreme pitcher’s park during that time, evidenced by the highly negative Plus/Minus of -0.9. Minute Maid Park, home of the World Series champion Houston Astros, has a similar dynamic. Batters there average a Plus/Minus of -0.8, and yet it is one of the six-highest owned parks in April. With the Texas parks and other venues that experience extremely hot weather during the summer — which is very good for batters — it seems the public doesn’t adjust to the colder weather during April and May. Considering that the season is starting even earlier this year in March, it seems like a great time to gain an edge here by fading the highly-owned yet negative-valued stadiums. One of the best values is Coors Field in June. That is the best time to target Coors batters, who average a ridiculous Plus/Minus of +1.8, and yet ownership goes down. My guess is that precipitation factors into whether DFS players take a chance on Coors Field batters. If you believe in the over in a Coors Field game, you can fire away in the betting market because the bet voids if it doesn’t play. DFS users have no such luck: If you roster Coors batters and it rains out, you’re taking a bunch of zeros and losing money quickly. That means it’s definitely worth it to embrace risk at Coors during the rainy season: You’re getting the best hitter’s situation in the best month, and the public is scared off. One more I’ll mention is SunTrust Park, which is where the Atlanta Braves moved to at the beginning of last season. Last year it had extreme splits. Batters in May posted a ridiculous +1.6 Plus/Minus, although it was closer to average during the rest of the year. We have only one year of data, and the numbers in May could be inflated by specific matchups or injury situations. 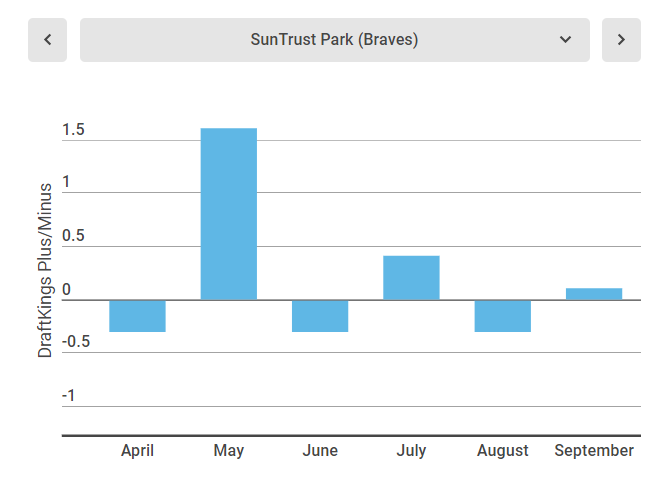 I’d take SunTrust Park data with a grain of salt until the sample grows. Instead focus more on the parks that change drastically from spring to summer. Here’s a final graph like the picture above organized by park.